working on my daughter's room. Well, it's now DONE! Yay! There is nothing quite like finishing a project. Yep. Love it! 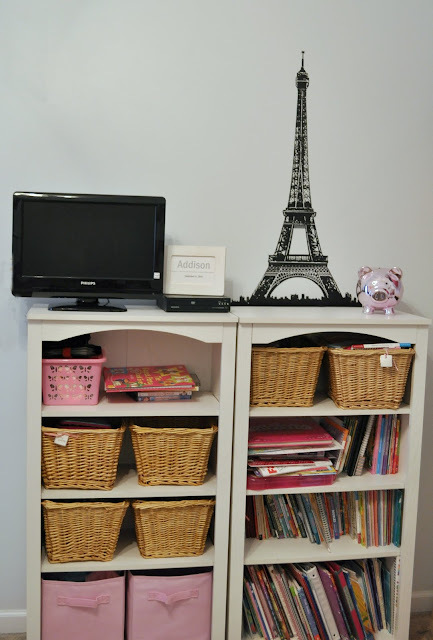 Paris and fashion so that was our starting point for this makeover. I am pleased to announce that she loves it!! Makes all the hard work worth it! 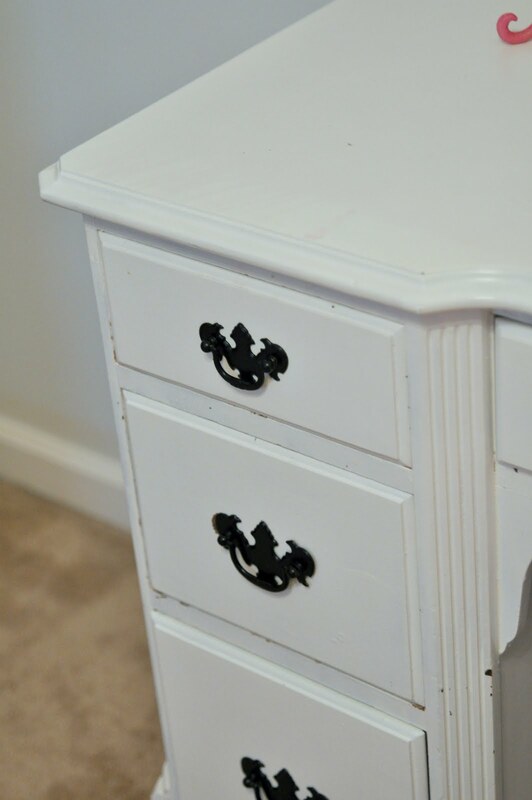 We started by painting the room with Behr Ultra in "Fresh Day,"
a very pale blue color. had and bought a bunch of bedding and pillows. for all her trophies and collectibles. 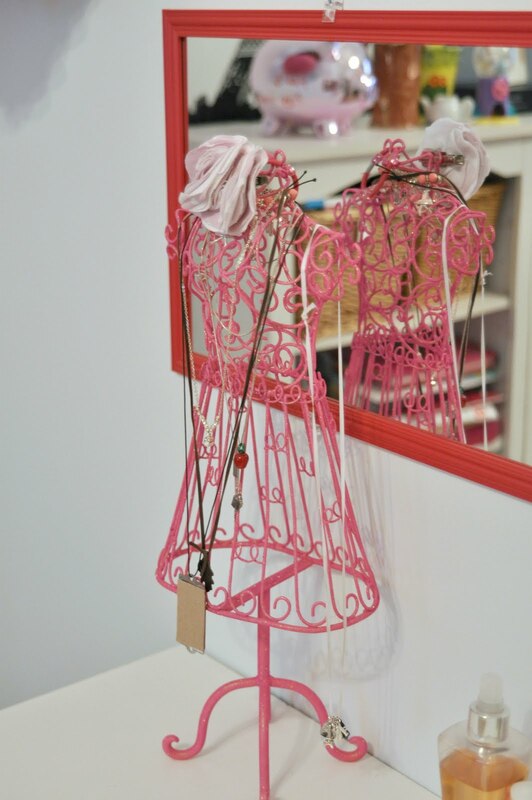 I used sheers hung from the shelf to frame the bed. 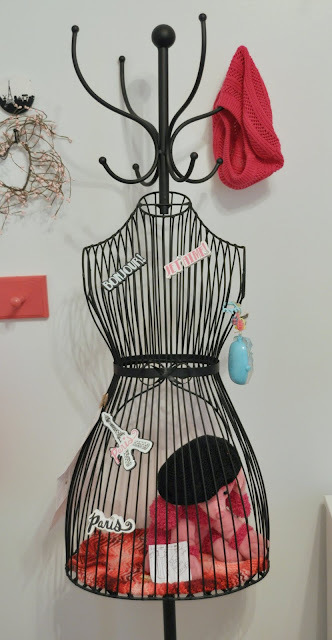 with white and black tulle tied to the cord. 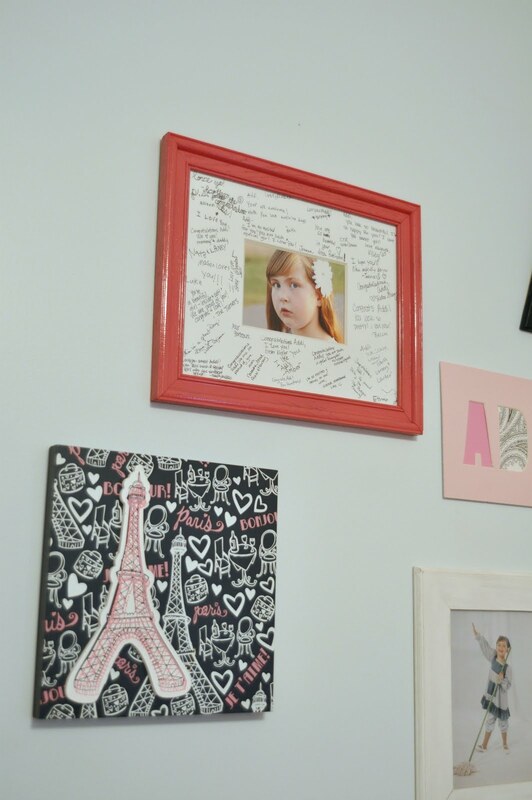 An up close look at the Paris picture above her bed. One of her requests was a window seat. This is the best I could come up with -a leather storage bench. hung from her existing curtain rod. - this girl is a collector. Above the shelves are a vinyl Eiffel Tower. This is one of our favorite parts of the room. lanterns from Under the Sycamore. framed fabric from a new magazine called Fresh Style. 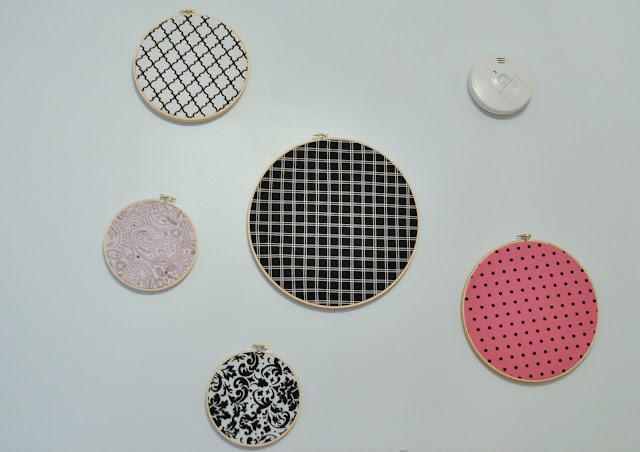 The smoke detector goes too, don't ya think? Safety first!! above her desk. It came that hot pink color. My daughter is excited to have so much room to see herself. She's also going to use dry erase markers on it for notes and messages. found her this hot pink jewelry stand. We used the desk she already had (which needs a fresh coat of paint). I just spray painted the handles. For the last wall we did a gallery wall. 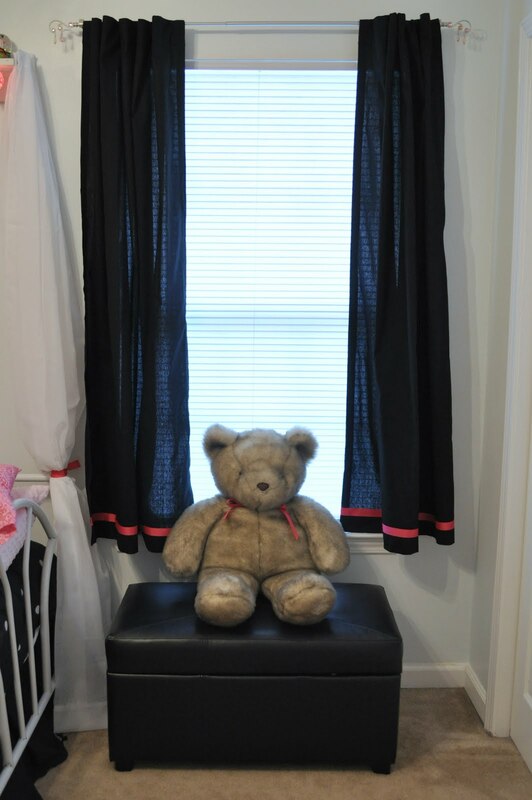 (She just had her 2011 dance photos taken wearing a hot pink and black costume. The top picture from her baptism last year. As the guests came to her baptism, they signed the matt. It's such a sweet keepsake. I simply spray painted the frame hot pink. The bottom Eiffel Tower print is her favorite. 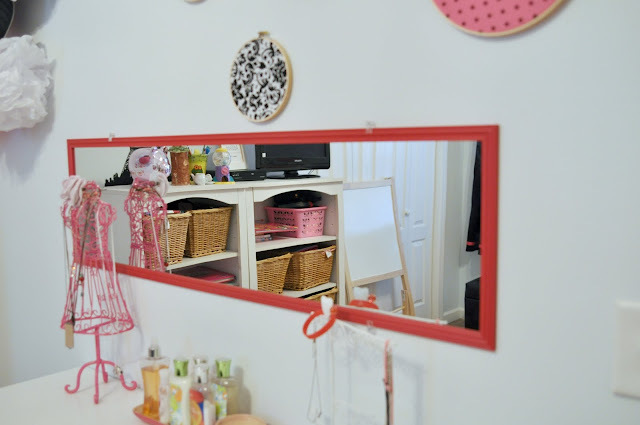 The cork board and peg shelf are from her old room. I just painted them hot pink too. 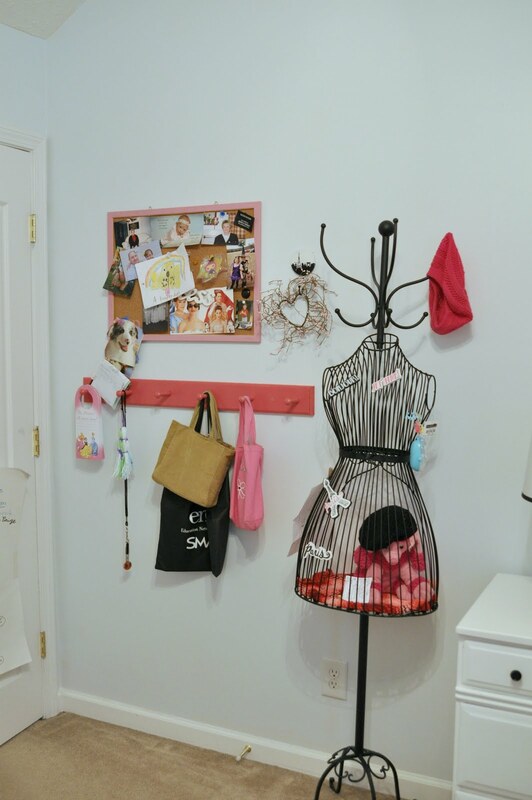 And her other favorite part of her room is her dress form. 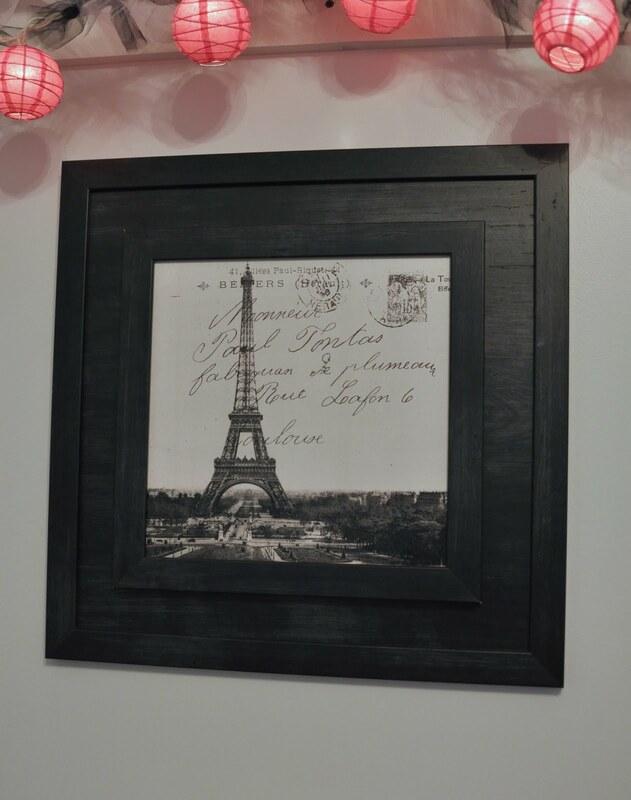 She loves to put notes and photos all over it with magnets and clothespins. 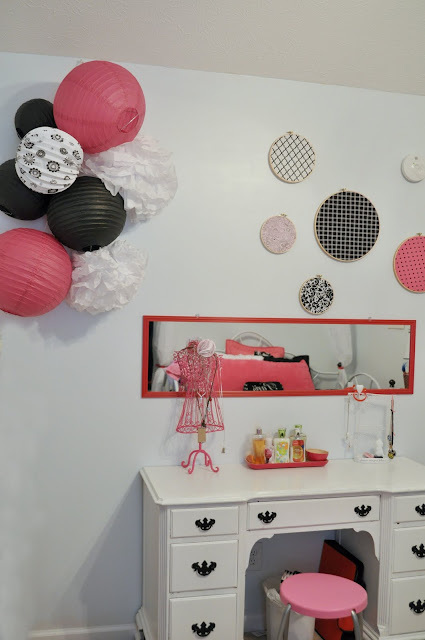 Here is a before look at her room. We had already started tearing it apart to prep for paint. And the after. My little girl has a big girl room- sniff sniff. Hopefully this one will grow with her! For a Grand total of $332 - not too bad! Wow! this is so cute! I love the color scheme and what you did with it! great job! I found your blog through a link party and I LOVE it! I am your newest follower and would love it if you would follow me too! Thanks! Wonderful touches in this room! 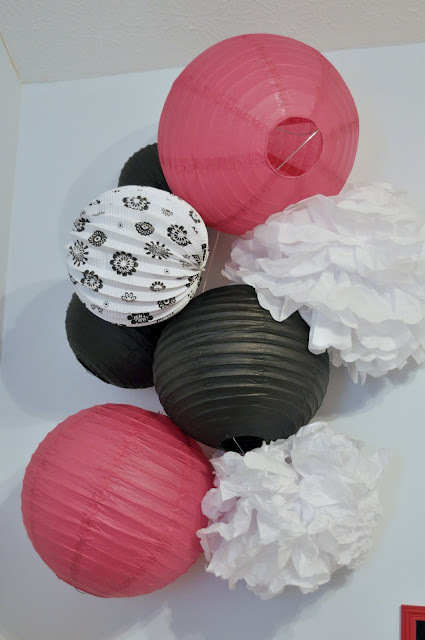 I love the pompoms, hoop wall art, mini lanterns, and the paint color you chose for the walls! 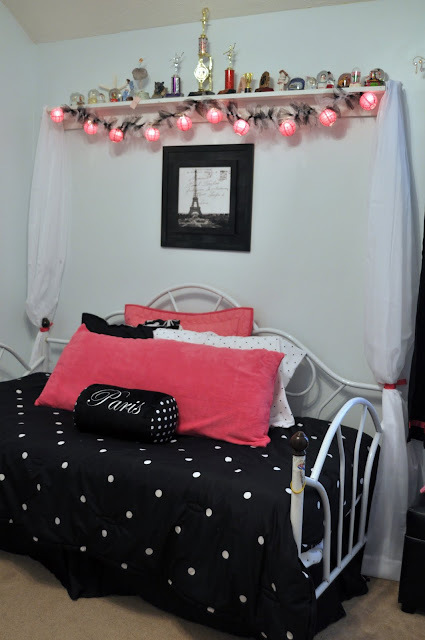 This is such a sweet room. I love all the little details. Thanks for linking to the party. This is so sweet. I love all the details and the color scheme. Thanks for linking to the party. I love it! 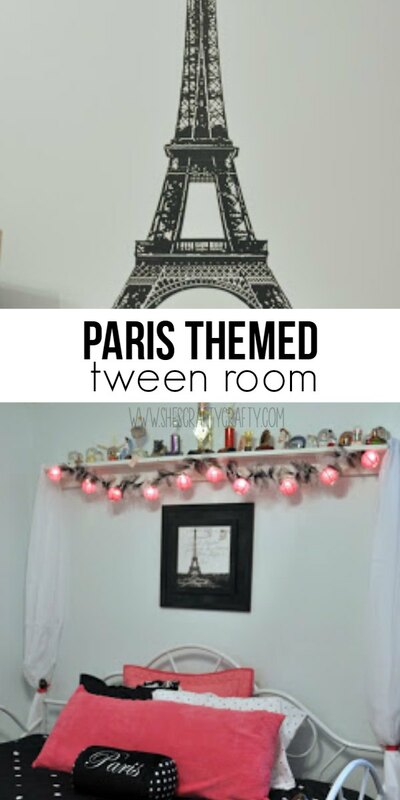 I am doing a Paris themed room as well, for my 13 year old. I haven't revealed it yet but a lot of the projects are from her room. I really love the lights you used. It's like 6 feet tall. If anyone's interested, there is a coupon code to get 10% off: DISCOUNT10, just use it at checkout. I love the dress form, adds a great touch! I'm a new follower, love your blog! I love your daughter's room. I especially like how you use the vertical space and placed the shelf of memorabilia up high. 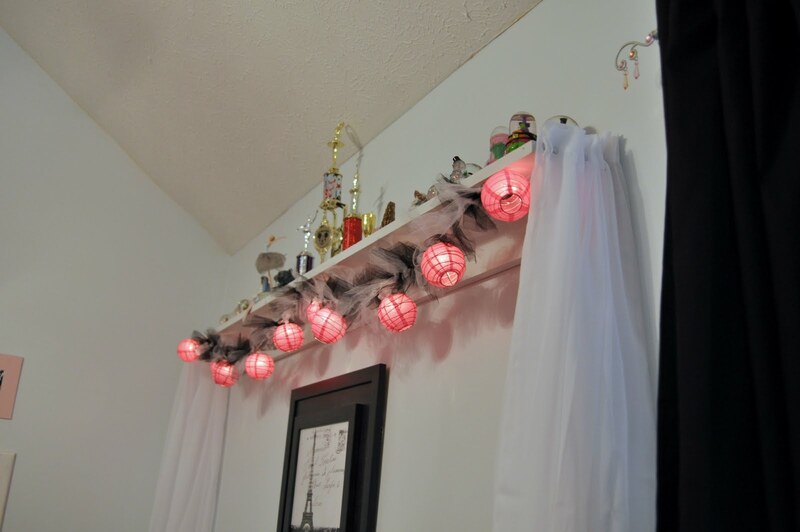 I may need to do something like that in my daughter's room for her softball trophies and snowglobe collection. My daughter's room has a Paris theme too. 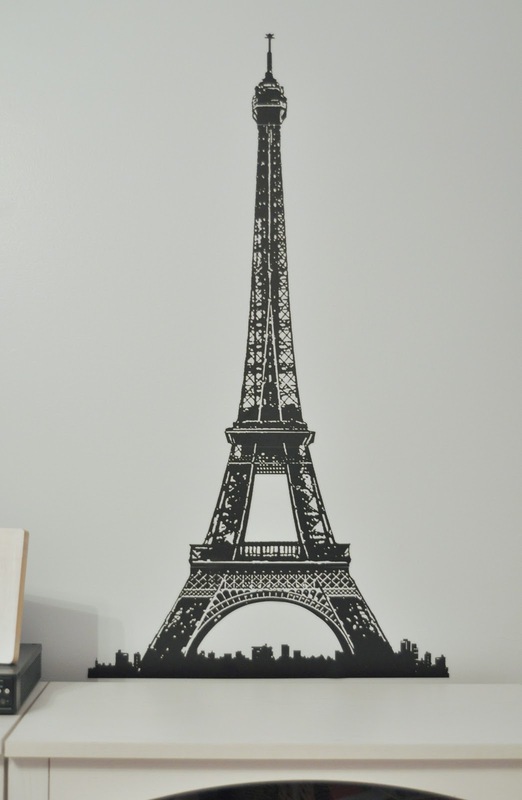 I used my Silhouette machine to cut out a vinyl Eiffel Tower for her bedroom door.